An interesting piece of information that emerges from the newly released list of candidates for Iraq’s 30 April general elections is that at least a dozen ministers and MPs previously considered part of the State of Law coalition will contest the elections on other tickets than that of the Iraqi prime minister, Nuri al-Maliki. In a similar category is list 230. It is focused on two State of Law MPs: Ihsan al-Awwadi (Qadisiyya) and Haytham al-Jibburi (Babel). The list is running in Basra, Mid-Euphrates and Diyala. Originally this movement emerged as the creation of former government spokesperson Ali al-Dabbagh who himself moved on to ISCI before these elections (though without appearing on their final candidate list). Whereas the schism between Dabbagh and Maliki appears to be final, pro-Maliki slogans are prominent in this successor party: Jibburi, for example, uses the slogan “hand in hand with Prime Minister Maliki” in his campaign. Other independent candidacies within the State of Law group of politicians seem less friendly to Maliki, and at least two of them could potentially be somewhat substantial. Other new lists based on defections from Maliki seem more limited to personalities and localities. Firstly there is Ali Fayyad and his list 226 running in Baghdad and with a few candidates in Najaf also. This is essentially Ali Fayyad’s personal creation. Judging from its posters, the list is apparently trying to appeal to tribal electorates in and around the Iraqi capital. Secondly there is former minister of state for security and current MP Shirwan al-Waeli with list 284. It will be running in his home province of Dhi Qar only after initial negotiations to have him as part of the Askari-Zurfi group appear to have failed. Thirdly there is minister of state Safa al-Din al-Safi, running list 201 in his own hometown Basra as well as in Wasit. It seems more detached from Maliki than one might expect given Safi’s sometimes key role in fixing problems for Maliki in the past. Safi has some links to the religious leadership in Najaf whose calls for “change” have been interpreted as a hint that a shakeup of the current government is needed. Fourthly there is Jawad Kazim al-Buzuni and list 238 running in Basra, Dhi Qar, Wasit, Babel and Baghdad. Apart from its outspoken, sometimes federalist key figure from Basra, the list comprises mostly academics with relatively low profiles. While the above statistics of defections are remarkable, equally important is perhaps the fact of relative dissipation – geographically and organizationally alike. Perhaps the bigger challenge to Maliki consists of those MPs who did not start their own new list but instead jumped to an existing enemy: Muwatin, dominated by the Islamic Supreme Council of Iraq (ISCI) and Ammar al-Hakim. They include at least the following: Janan Abd al-Jabbar Yasin (Basra), Hussein al-Assadi (Basra), Ali Kurdi al-Husseini (Karbala; now on Muwatin list in Baghdad), Manal Hamid al-Musawi (Karbala), and Ahmad Habib al-Abbasi (Babel). It has been suggested that it is the acceptance of post-election bloc formation in Iraqi parliamentary politics (following the precedent of 2010 and the disputed supreme court ruling enabling this) that has prompted so many State of Law politicians to try their luck on their own this time. But as long as the numbers of MPs affiliated with each bloc count as much as they do in Iraq – both practically and in terms of prestige – it is somewhat difficult to take at face value the talk of friendly and temporary divorces emanating from some of the players involved in these developments. And with respect to the defections to Muwatin, in particular, there can be no doubt that this is bad news for Maliki. The likely outcome of all of this is a reduction of Maliki’s total bloc size and therefore his stature. Additionally, these acts of defection also tell important stories about how people whose livelihoods depend on the outcomes of these elections think the result will shape up. The Iraqi election campaign formally began Tuesday, but the official candidate lists weren’t published until Thursday evening, just before the start of the Iraqi weekend. Altogether, the lists contain the names of 9,045 candidates. A noteworthy general point is that unlike previous years, no provisional list was published pending appeals regarding de-Baathification and other candidacy problems. In other words, the current list purports to be the final. IHEC maintains that, after its latest showdown with parliament (in which it prevailed after parliament decided to backtrack), all appeal options have been exhausted. As for the characteristics of the main lists, at least a few tendencies can be noted in this material. Starting with the Shiite Islamists lists, there is the State of Law list of Prime Minister Nuri al-Maliki (277). Many of its top candidates run in Baghdad: In addition to Maliki himself at top of the list, deputy PM Hussein Shahristani is second and Haydar al-Abbadi is third. In Basra, former governor Khalaf Abd al-Samad is the top candidate, and several prominent provincial council members are now trying their luck as MP candidates. In Qadisiya, Khalid al-Attiya, the former deputy speaker of parliament, is the State of Law candidate number one, whereas figures from the Badr movement are at the top in Wasit and Diyala (Qasim al-Aaraji and Hadi al-Ameri respectively). A notable cooption from Sunni-secular circles is Iskandar Witwit (formerly Iraqiyya deputy; now State of Law candidate no 9 in Babel). For their part, ISCI-dominated Muwatin (273) has a current MP as top candidate in Basra (Furat al-Shaara), a former governor as top candidate in Dhi Qar (Aziz Kazim Alwan), and a former provincial council speaker as top candidate in Najaf (Abd al-Hussein Abd al-Rida). In a possible sign of sectarian times, in Qadisiyya they have managed to coopt the former (Shiite) Iraqiyya deputy Hussein al-Shaalan, where he is now their number three candidate. Watch out for their Baghdad personal vote results: Behind Baqir Solagh (former finance and interior minister) they have chameleon Ahmed Chalabi as their second candidate, followed by Ibrahim Bahr al-Ulum (oil minister in the CPA period). Also some figures from smaller entities appear in prominent Muwatin list positions elsewhere, including as Hassan Radi al-Sari of the “Hizbollah in Iraq” movement as number one in Maysan. As for the Sadrists (214), to a greater degree than the two other big Shiite lists, they rely on relatively unknown politicians at top of their lists. An exception is Baghdad, where Hakim al-Zamili is number 2, Maha al-Duri no. 4, and Falah Hasan Shanshal (briefly de-Baathification head) no. 5. As has been clear for some time, both Fadila (219) and the Jaafari splinter group from the Daawa (205) run separately. Prominent Fadila candidates include Suzan Aklawi (no. 4 in Basra) and Ammar Tuma (top candidate in Baghdad). The Jaafari list has relatively few famous top candidates. In addition to Jaafari himself there is Muhammad al-Hindawi in Karbala. It is noteworthy that the efforts to establish a pan-Shiite alliance in Diyala seem to have failed, because all the main groups are fielding separate tickets there. 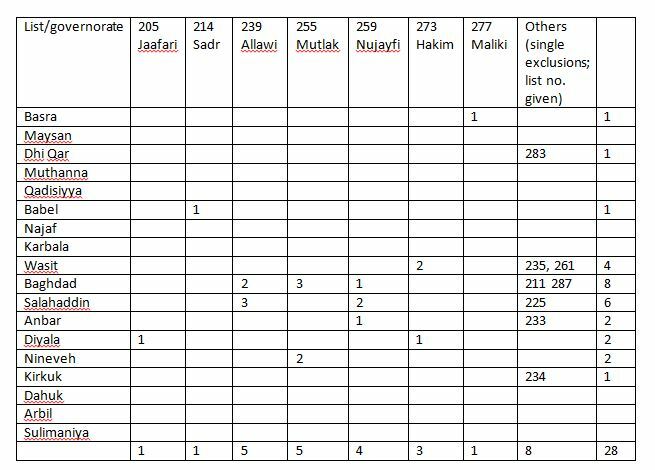 In Kirkuk there is a Shiite-dominated Turkmen list (282) including pro-Maliki figures like minister of state Turhan al-Mufti. Rumoured Maliki allies close to the Asaeb Ahl al-Haqq are everywhere running separately as list 218, Al-Sadiqun. Turning to what was formerly the Sunni-secular Iraqiyya, it makes sense to start with Mutahhidun headed by parliament speaker Usama al-Nujayfi (259). Prominent Mutahhidun candidates – beyond Nujayfi himself as no 1 in Nineveh – include Muhammad Iqbal (no. 3 in Nineveh), Falah Hassan Zaydan (no. 6 in Nineveh), Muhammad Dalli (no. 3 in Anbar), Zafir al-Ani (number one in Baghdad), Umar Hayjal (5 in Baghdad) and Attab al-Duri (female candidate, no. 7 in Baghdad). In a sad testament to the sectarian polarization in Iraqi politics (and an apt geographical illustration thereof), Mutahhidun is not running south of Baghdad whereas it is backing pan-Sunni lists in Diyala and Kirkuk. The Arabiyya bloc headed by deputy PM Saleh al-Mutlak (255) is also limited geographically to Sunni-majority areas. Mutlak himself is the top candidate in Baghdad. Parts of old Iraqiyya still remain in list 239, now called Wataniyya under the leadership of Ayad Allawi. In Anbar, their number one candidate is Hamid al-Mutlak; in Diyala it is Abdallah Hassan Rashid; in Nineveh Salim Dalli is number two. In Baghdad they obviously have Allawi himself as number one, followed by former Iraqi Islamic Party member Ala Makki as third, and prominent female parliamentarian (and bloc spokesperson) Maysun al-Damluji as number four. For the Kurdish lists, one of the most prominent aspects is the absence of a unified list in most areas, including in so-called disputed territories where they have historically put in much effort to remain united. The continuing power struggle and impasse in the internal KRG government formation process following elections last years may well be part of the explanation. Some smaller lists are interesting, in particular the Iraq coalition (262) which stands out for competing in Sunni and Shiite areas alike. In Baghdad the list is topped by former minister from the CPA period Mahdi al-Hafez and is also featuring former Fadila figure Nadim al-Jabiri. In Salahaddin, they have Qutayba al-Jibburi as no. 2, a former Iraqiyya MP who split from them in early 2012 after the controversy ove the Hashemi affair. This list is perhaps the most credible cross-sectarian alternative that has emerged in the ashes of Iraqiyya (perhaps in addition to list 232 which is close to the old communists). By way of contrast, other Iraqiyya breakaway entities are not running across the country. A case in point is White (288) which is not running in Sunni areas north of Baghdad. Other new parties are also often geographically limited. In Basra, the former Sadrist Uday Awwad is topping his own list (270). There is also a women-only list with 5 candidates (281) and federalist Wail Abd al-Latif is trying his luck with at the head of yet another new party (228). Former Maliki ally Shirwan al-Waili has his own list (284) and he is himself its top candidate in Dhi Qar. 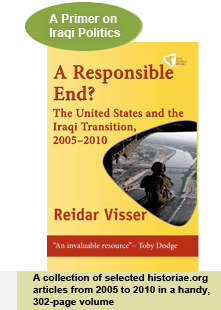 Generally speaking, fascinatingly – and despite the general sectarian polarization regionally – issues like de-Baathification have been less prominent in Iraq this year than ahead of the last general elections in 2010. Instead, the dispute of the 2014 budget (and the failure of parliament to pass it) has been a main background factor. The budget is at least a political issue that is connected to some important ideological differences regarding interpretations of federalism. Clear battle lines between the Maliki government and the Kurdish regional government aside, the process remains somewhat opaque though: Maliki has reportedly this week complained to the federal supreme court about parliament’s procrastination over the budget passage. In election times, would it not be more logical to ensure wider parliamentarian backing for the budget? Surely that is doubly relevant these days, when Maliki allies already talk about forming a “political majority” government after the elections. Their efforts over the next few weeks will decide whether such a prospect is realistic at all.